This Carolina North 10020 ratchet with rope and hook is a locking tie-down for securing heavy loads or hoisting. It has a zinc-plated steel hook for strength and resistance to corrosion and a glass-filled nylon outer casting for resistance to wear. The rope is braided polypropylene for strength and is 3/8" in diameter and 8' in length. 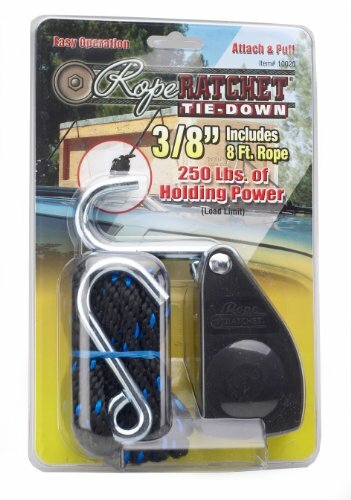 This rope ratchet has a thumb release for quick detachment and has a 250-lb. capacity. Carolina North manufactures lifting equipment such as ratchets, hoists, and hangers. The company, founded in 1991, is headquartered in Kernersville, NC. If you have any questions about this product by Carolina North, contact us by completing and submitting the form below. If you are looking for a specif part number, please include it with your message.